When Pete Solomon, a neglected twelve-year-old boy, and Justin bring a wounded wolf-dog hybrid to Dr. Lucy, the outcasts soon find refuge in one another. Lucy never thought she’d make connections again, never mind fall in love with a man like Calvin. Pete never imagined he’d find friends as loyal as Justin and the dog. But these four people aren’t allowed to be friends, much less a family, when the whole town turns violently against them. I enjoyed this book. I really thought that this was going to be a book about a dog based on the cover. I obviously did not read the book's summary prior to starting this audiobook. There is a dog in the book but that dog is really not the main focus of the story. This was a story about race, love, and what really makes up a family. I am so glad that I stumbled upon this wonderful story. This book is told from two points of view. Dr. Lucy takes care of animals and the occasional human that comes to her for help. She lives a rather isolated life on her ranch and likes it that way. Pete is a 12 year old boy that happens upon a wounded dog laying on the side of the road and feels compelled to help. Pete finds help for the dog in Dr. Lucy and so much more. The characters in this book were wonderful and they all had their own complex story to tell. Dr. Lucy has been through a lot. The book is set in a time where people do not want to take a female doctor seriously so Lucy uses her skills to help animals. Pete has had a lot to deal with in his short life. Despite the way he is treated, he is still such a good kid and works hard to do what he feels is right. Justin and his father, Calvin, are new in town. The town has not been welcoming to them and has treated them poorly because of the fact that they are African American. I loved the way that the relationships between these characters developed. If the rest of the world would simply go away, these four people would be very happy. Pete and Justin have so much in common and I loved watching their friendship progress. Lucy goes from being alone most of the time to have a real connection to Pete, Justin, and Calvin. Everything about their interactions seemed natural and it made me very angry that the local citizens did everything they could to not allow any of the connections to exist. The narrators both did a great job with this story. I really do enjoy it when audiobooks utilize multiple narrators. Nick Podehl did a great job with Pete's point of view which was no small task since the character is a 12 year old boy. Teri Schnaubelt voices the parts that were told from Dr. Lucy's point of view. Both narrators were able to bring a lot of emotion into the story telling and were very pleasant to listen to for long periods of time. I would not hesitate to listen to either of these narrators again in the future. I would recommend this book to others. This was a very well told story that really care about the characters. 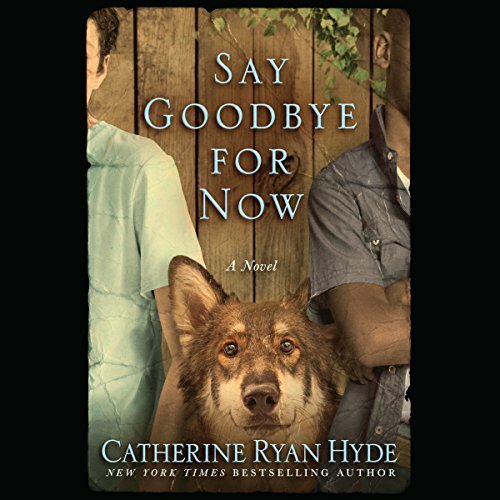 This was the first book by Catherine Ryan Hyde that I have read but I wouldn't hesitate to read more of her work in the future. Catherine Ryan Hyde is the author of thirty-three published books. Her bestselling 1999 novel, Pay It Forward, adapted into a major Warner Bros. motion picture, made the American Library Association's Best Books for Young Adults list and was translated into more than two dozen languages for distribution in more than thirty countries. Her novels Becoming Chloe and Jumpstart the World were included on the ALA's Rainbow List; Jumpstart the World was also a finalist for two Lambda Literary Awards and won Rainbow Awards in two categories. The Language of Hoofbeats won a Rainbow Award. More than fifty of her short stories have been published in many journals, including the Antioch Review, Michigan Quarterly Review, the Virginia Quarterly Review, Ploughshares, Glimmer Train, and the Sun, and in the anthologies Santa Barbara Stories and California Shorts, as well as the bestselling anthology Dog Is My Co-Pilot. Her short fiction received honorable mention in the Raymond Carver Short Story Contest, a second-place win for the Tobias Wolff Award, and nominations for Best American Short Stories, the O. Henry Award, and the Pushcart Prize. Three have also been cited in Best American Short Stories. That dog on the cover is so gorgeous! Glad you enjoyed this one, it sounds good. Great review. Great review. I read this last year and loved it. This author did another book with great characters (and another dog) called Worthy. If you liked this one, you should check it out too! It was your review that had me running to buy this one, Barb. Thanks for the recommendation. The dog is front and center on the cover. That is rather misleading but I'm glad it was enjoyable for you. I ♥ audiobooks. The dog is in the story but I felt that the relationships between the characters was really the main focus. This sounds wonderful Carole. The characters sound like those that I would love to follow on this emotional journey. I’ll have to keep and eye out for this one. I hope you get the chance to read this one, Jenea! I love books that use multiple narrators! it's great to hear you had a good time with this one! I did enjoy it, Melliane! Oh, what a touching and bittersweet story. I like the sound of it so thanks for sharing about it. Reminds me of a relationship situation in Carolyn Brown's latest The Sometimes Sisters. The characters really had a whole lot to deal with in this book. I just did this the other day with an audio, I swore I read the synopsis and was surprised. Thankfully like you it turned out to be wonderful. I think I would enjoy this one Carole. I try to go into books rather blindly. I will read the synopsis but usually forget by the time I actually read the book. I thought it was about the dog, too, haha. But I'm glad to hear it was a touching story and that you enjoyed it! Lovely review, Carole! There is a dog but the focus is really on the people. That is always what I think when I see a dog on the cover of a book.